Viral hepatitis is currently the world’s 7th deadliest human disease. To mark World Hepatitis Day on June 28, SCOR Global Life Medical Director Dr. Gabriela Buffet shares some key points about this widespread pathology. Viral hepatitis not only kills thousands of people daily due to major liver damage, but also due to extrahepatic manifestations. At the end of 2015, approximately 325 million people were living with the disease – approximately 80% of whom were infected with hepatitis B (HBV) and 20% with hepatitis C (HCV). In poorer countries, the problem is exacerbated by the little access to testing and treatment. Nevertheless, global efforts to eliminate the disease are gaining ground. Last year on World Hepatitis Day, the World Health Organization published information gathered from 28 countries indicating that treatments are advancing. 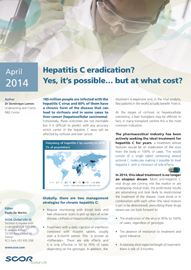 Here are the key points that underwriters should retain on viral hepatitis. The HCV infection, with hepatic or extrahepatic manifestations leading to chronic inflammation, is the only chronic infection that can be cured. In an effort to reduce the morbidity and mortality associated with HCV, access to screening and treatment has increased significantly over the past two decades. In the short term, continuing to strengthen screening and access to care is the most important factor in eliminating the viral C infection. In countries that have access to advanced pharmaceutical treatments, SCOR’s medical experts are seeing highly efficient therapies that are simple and well-tolerated by patients. These treatments deliver good results in a relatively short period of treatment, as foreseen in our 2014 paper. Discussions are also taking place on opportunities to screen entire populations instead of treating the costly consequences of the disease (source: Cousien et al.). 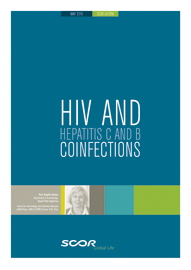 The hepatitis B virus infection remains a global public health concern with approximately 254 million individuals becoming chronic HBsAg carriers worldwide. In China, where a major prevention and eradication project is currently underway, 7% of the population is infected. Whether or not the viral infection becomes chronic depends on a person’s age at infection, and the need for treatment depends mainly on the stage of the disease. As a hepatitis B vaccine has been available since 1982, all individuals who are exposed should be screened and vaccinated, ideally at birth or during early childhood. The vaccine is 95% effective in preventing infection and the development of chronic disease and liver cancer due to hepatitis B (source: WHO). The hepatitis E virus, or HEV, is currently recognized as an endemic pathogen in developed countries, particularly in Western Europe. In these regions, HEV is a zoonotic agent and is mainly transmitted through the consumption of undercooked pork and tends to be self-limiting in people with a normal immune response. In France for example, the virus affects approximately 100,000 individuals. Extra-hepatic manifestations associated with HEV infection were recently observed, suggesting a broader tropism than initially considered. Breast cancer is the most prevalent type of cancer in women, where approximately 1 in 8 are diagnosed with this disease during their lifetime.